A transit agency partnering with a car sharing service is not normally earth shattering. For example, WMATA, the transit agency in the DC area, did it 15 years ago, originally with Flexcar I think, and then Zipcar when the firms merged ("Metro's SmarTrip Card and Zipcar Now One," Business Wire). 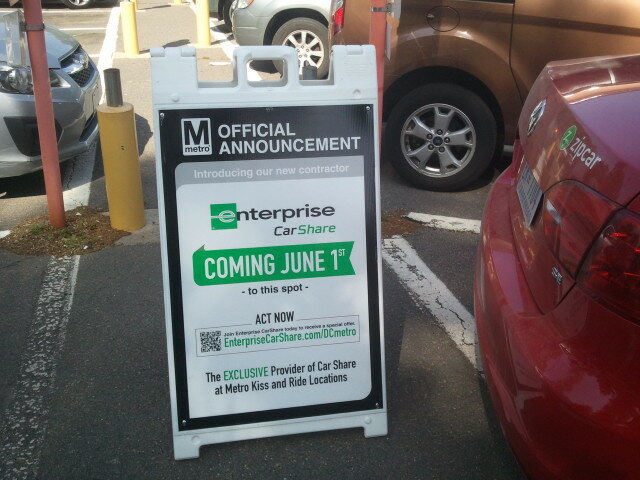 Now it's with Enterprise (link to Zipcar message about the change in 2015). The firms bid high for exclusivity, but I've argued that instead transit agencies should make station sites "open access" ("Multiple missed opportunities in the creation of the Silver Spring Transit Center," 2015, item #6). Companies wouldn't pay as much for spaces meaning revenue for the transit agency would be lower overall, but rider-customers would be able to use the services they are members of, which aren't necessarily the one that won the bid. Overall, rider convenience would be greater. For example, Enterprise likely outbid Zipcar for non-market reasons (to box them out), but because Flexcar-Zipcar was the first mover in this market, they have a much larger user base, and because most transit station catchment areas still have Zipcars close by, it's not much of an imposition and so users aren't likely to shift to Enterprise. Similarly, the one-way service Car2Go has service in DC and Arlington County and it would be cool if outside of those home areas, transit stations across the metropolitan area were considered "home stations" part of the network. This is one of the downsides of not having an integrated transport association in a metropolitan area ("The answer is: Create a single multi-state/regional multi-modal transit planning, management, and operations authority association," 2017, and the difficulties of mixing and matching nonprofit and for profit services ("Another example of the need to reconfigure transpo planning and operations at the metropolitan scale: Boston is seizing dockless bike share bikes, which compete with their dock-based system," 2018). Angelenos can now make connections between metro station parking lots using a car-sharing app to rent and drive a car to the desired station, Los Angeles County Metropolitan Transportation Authority said in a news release. Users can find a nearby car, book it and unlock it through the app, with prices beginning at $5 per hour depending on the vehicle type, Metro said. The new transportation feature is a result of a partnership between the Los Angeles County Metropolitan Transportation Authority and Getaround, a San Francisco-based car-sharing app, which is licensed to occupy 110 parking spaces at 27 L.A. Metro station lots. 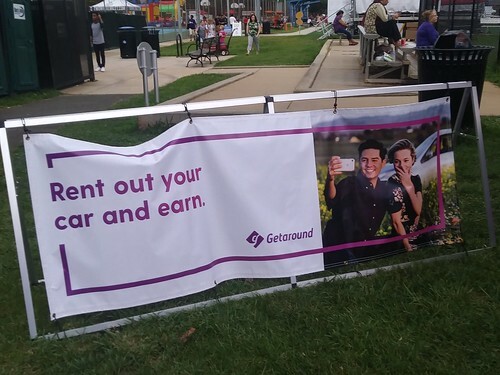 Getaround is the app provider and creator of the service platform or "product-service-chain," probably helps car owners with getting the right insurance, and takes a percentage of the rental fee. But the cars, like ride hailing services, are owned by individuals, not a company, unlike the cars for Zipcar, Car2Go, Enterprise, or Free2Move. That enables regular people to participate on a profitable basis within "government contracts" that normally don't provide this kind of opportunity for non-corporations. Getaround is offering a $25 driving credit for new users as part of the promotion with LA Metro. 2. But the other thing a partnership with Getaround might offer is a way for transit agencies to "expand the sustainable mobility platform" in smaller metropolitan areas where the traditional corporate car sharing companies aren't likely to be active.